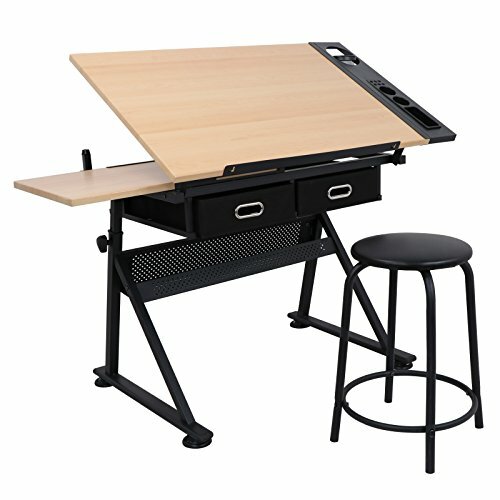 0.3 Ready to Pick the Right Drafting Table? Every pencil artist knows that for drawing you need patience, and for the patience you need time. 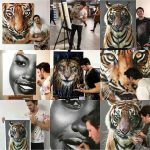 So if you are serious about it, then you will spend a lot of time in front of your drawing table or drafting table. But unsuitable drawing table or drafting table can become torture, and you will suffer from back pain very fast. The wrong posture will enforce you to stop drawing and thinking how uncomfortable is behind this desk. Behind flat drawing tables, we mostly lean towards, and posture is everything but natural. To avoid this problem, you need drafting table for drawing and a good chair to satisfy your backs. And your backs will thank you, but also your drawings will benefit. 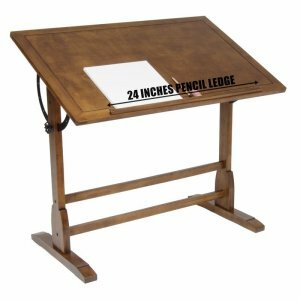 Advantages of drafting tables are multiple, and all professional artists have some drafting table for drawing. Some of them have DIY tables, made by their needs. And others choose to go with proven drafting tables, which are easy to get from the market. Or with portable drafting tables, which are ideal for little space interiors. The most significant benefits of all are flexible working space, to the smallest details. You can tilt table to your desired angle, the angle that provides you natural movement with hand and pencils. Tilted table gives you right angle view to the drawing, and that means that you will avoid distortion on your drawings. The thing is that behind the regular flat table you look at your drawing from the wrong angle like you see on the image. And this leads to effects that can we often see on 3D drawings, but this time, we have distortions that we don’t wish to have. For example, working on portrait looking under the right angle is crucial, if you use the wrong angle you will finish with wrong proportions. 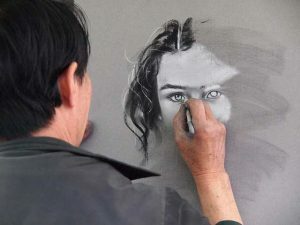 You can often see that portrait artist use easels for portraits, and that is because they have a drawing set up vertically on the line with their eyes. And this way distortions are avoided altogether. When you draw on flat drawing desk, you must lift your drawing to check if proportions are correct. Little annoying if you ask me, mostly when you work on something super detailed. And all proportion and relations must be perfect, and with drafting table is much easier to have drawing proportions under control. The best angle for drawing on drawing table or easel is 90 degree, which would be parallel with your point of view. But this is only in theory, in practice artist set their drafting tables between 45 and 20 degrees. The reason is that twisting hand to 90 degrees isn’t comfortable because your hand doesn’t have a resting place. There are some tricks to rest palm on mahl stick, mostly used by oil and acrylic painters. The comfortable drawing area is crucial; the artist must be part of this area. Like I said before, drawing is a process very everything goes slow. Among tilt option of the main board to desired angles, there are few more important add-ons. Adjusting heights, we are not all the same heights, so you aim to buy drafting table with changing heights. Another reason is maybe if you plan to get this table for a kid, then this is smart long term investment. Easy assembling and dissembling for storage ( I have set up my table under the window, to get natural light. And I mostly draw during the day, so better place from this spot I can’t get. But sometimes tight places are not allowing to have all the time drafting table in the room. 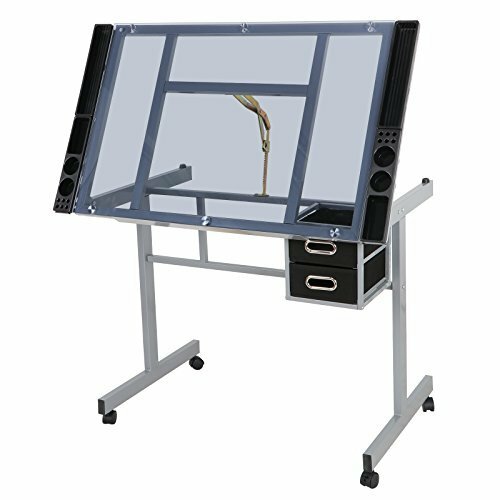 If you are low on space, maybe you should think about portable drawing table. They are even more popular than drafting table, because of mobility. You can go with them anywhere, even to the park if you wish. Light. If you spend a lot of your drawing time during the night, then the light is crucial. Try to get a light that has natural daylight color, so that you have the most accurate view of the drawing. Also, make sure that you setup light high enough, so you don’t block light that you need on your drawing. Many artists have the wrong kind of table lamps, mostly because height is not adjustable. And you come to the problem that you have shadows during drawings, make sure to get adjustable table light. You will able clearly to see your colors if you draw with colored pencils. 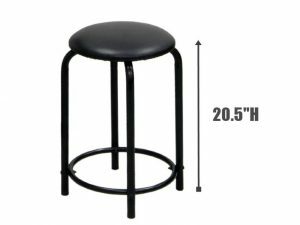 A chair that is adjustable, because if you change the tilt to different angle then also different heights must be setup on the chair. Also, make sure that you get anatomy approved chair. Picking the right chair is important same as choosing the art drawing table, so take your time and choose wisely. Your backs will thank you later. Trays for keeping your art supplies near the hands, don’t go without them. Tilted surface for drawing are great, but that leave us without a surface for our colored pencils, crayons, chalks and other art supplies. So make sure that you get a table with trays. 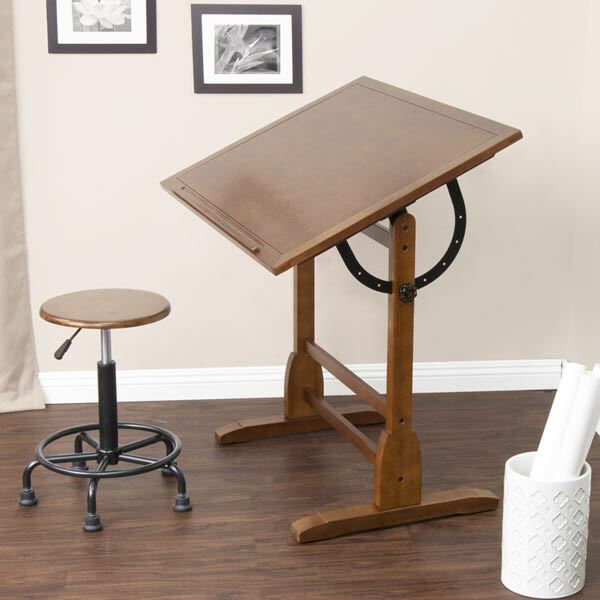 Ready to Pick the Right Drafting Table? 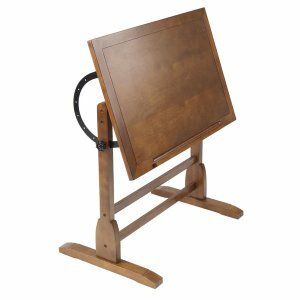 Among all the great drafting tables only a few are best drafting tables for artists, because if you wish to have all add-ons that we have mentioned you will have a headache to find the right one. 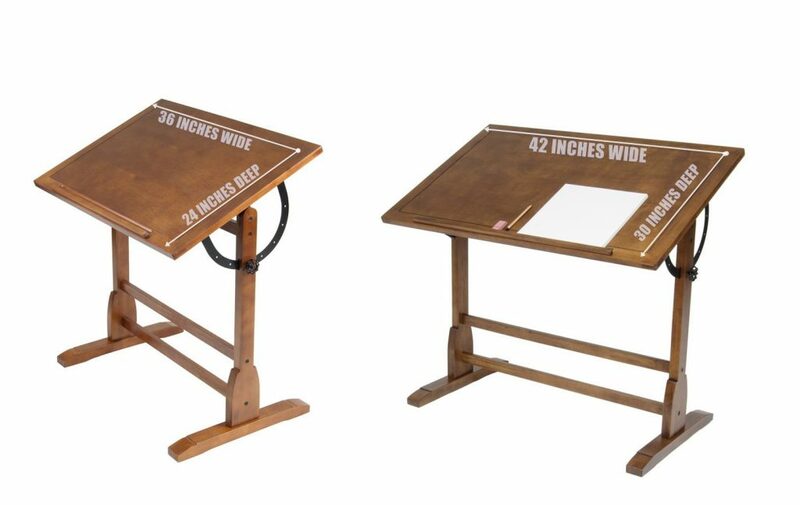 Old sturdy drafting tables are excellent solutions, but they are hard to find. And if you find one then you will had to give a fortune, and I hope you have that money. But luckily there are still on the market great drafting tables, which are following old designs and materials. And also modern designs with modern materials, like glass tabletops and aluminum constructions. 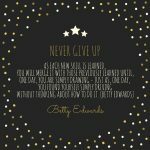 Which will be best for you is all about you, you should ask yourself few questions before you get your table. How much space you have? There are different designs of drafting tables, and some of them occupy a lot of space. Make sure to have enough space. Do you must often move drafting table, or it will be one place all the time? If you must move a lot your table then, you should get aluminum made drafting table, which is much lighter and easier to manipulate around the space. And wheels on the legs would be great because by pulling you can scratch your floor. If you have your space for drafting table reserved, then sturdy wooden drafting table is also a good choice. Especially if that spot is under the window, where you get the most of natural light. Do you have a place for keeping your art supplies and artworks? If you don’t have, then choosing a table with drawers would be a good idea. Easily accessible pencils, crayons, pastels and all others art supplies are only possible if you have drawers, and shelves near. The best choice is when is everything integrated with a drawing table, and in reach of your hands. Table top material. I will be honest with you; I don’t love the glass on the table. But that is my personal way of looking; there are lots of advantages of glass. And the last one, how big budget do you have? And that is something that only you can decide, but I always say to my friends that I’m not rich enough to buy cheap. Don’t go over a limit, pick something in the middle class, between $100 and $250 you can get a decent table. If money isn’t a problem, then you have more options but have in mind that some are overpriced. Eclipse Craft Center Drafting tables are designed with the purpose to give an artist comfortable working place, with an accent to accessibility to art supplies. With three drawers that are in reach of hand and one shelf, you can keep all art supplies near you. For keeping your artworks and other necessary things there is another storage shelf under the desktop. Tilting is possible to 40 degrees which cover the most popular setup between 20 and 30 degrees. On edge, you will find 24-inch pencil ledge, and it is adjustable. When you tilt you desk it can slide up pencil ledge and locked it, when is a table in the flat position you can lower pencil ledge? For tilting, there is heavy gage steel construction, which assures sturdy stability. And you can be sure that you will not have a problem with instability when is in tilted position. The table top is made of black plywood, which gives a modern, stylish look. Also, there is an option with black frame construction and white table top, and shelf. From my side of view I would go for Black/Black option, it is easier to clean it. On White/Black drafting table you will see even a little drop, for instance, if you use watercolors of acrylic colors. 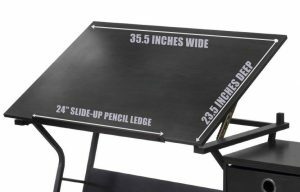 The dimension of working table top are big enough to have a drawing and reference image on it, and 24" slide-up pencil ledge will ensure that pencils stay on the table. Nice bonus is a padded stool that comes with a drafting table; it is not maybe best one for longer sitting. But it can be used for a shorter time, make sure to use a chair or padded stool which ensures a healthy posture. Three drawers are built from fabric, but they are not sturdy enough to keep inside heavy objects. For colored pencils, crayons, and similar art supplies you don't have to worry. 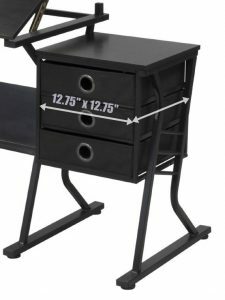 The size of each drawer is 12.75" x 12.75." Designer of this table probably had in mind mobility of drafting table, when is lighter it's easier to move. 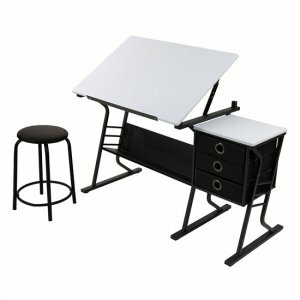 For more information check reviews from customers who bought Eclipse Craft Center Drafting Table. The first thing that we can notice on this drawing table is design, which is awesome. The vintage drafting table look gives a unique touch, and this is art table that looks like a piece of art. Studio Designs are known for quality products and using quality materials. On this drafting table they used sturdy wood with oak finish. If you are a vintage lover, then this table could be perfect for your art space, this is a design that will overcome all newcomers. If you just look the design, you can quickly notice that is designed old school, with a touch of history. With sturdy wood which is 98% of the drafting table, you will get the table that will last for generations, a table that will follow you on your art journey. Many artists when they choose their drafting table, it is a bond that lasts forever. 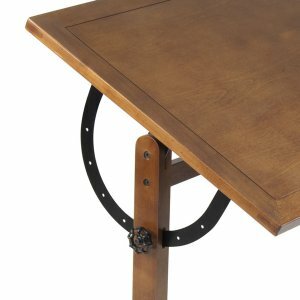 So investing in the table that is durable like this wooden drafting table is the best bet, it is a table on which you can be sure that will stay sturdy like on the first day. The benefit of this desk is also that it doesn’t look like an intruder in living space, and because of that its first choice for many artists. When is desk flat, you can’t even notice that this is a drafting table, it’s looks like regular writing table? And of course, you can use it that way! 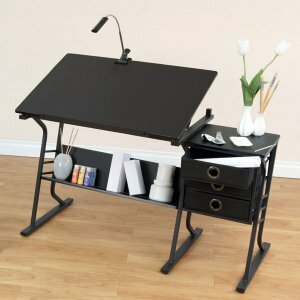 It’s adjustable drawing table for use by your need, you can draw, paint, write or even use it for your computer. But this last option I don’t recommend, because it would be the waste of this table. Tilting is possible to 90 degrees, and this is a part which I love the most. The possibility of tilting table to 90 degrees gives that view to artwork that we all aim for, correct view. Without distortion. It is known that is good to step back from painting or drawing to get another perspective on artwork, with this table you can do this. Tilting to 90 degrees you can achieve right perspective, and review your art. Another great thing is that is available in two sizes, you can choose among 36″W x 24″D size or bigger one 42″W x 30″D . I would go for bigger one because I love to have more than one reference images, so I can keep them all on the working surface. Advantage of tilting to 90 degree is one of the best functions on this drafting table. Ability to change distance is giving you another perspective to your work; you can even rotate your artwork to change perspective even more. Or you can use mirror opposite to a drafting table, and that is another useful perspective to review your art. Profesional finish work on this table is pleasant for eyes and hands. To tiniest parts, everything is done with an accent to quality, from edges to working surface. This is a drafting table which will last for generations, and it can be your fellow companion that will never disappoint you. 24 inches pencil ledge will keep yours pencils and paper on the table, you will only need to get used on the ledge. If you are coming from flat drawing table to drafting table, then ledge could be an as little hindrance on the beginning. But with time you will lose that feeling, and you will not even notice that is there. It is important to say that on both size of table smaller and bigger pencil ledge is 24 inches. Antique design and finish will fit most of the interiors, this is a design that is modern forever. Solid hardwood aims to give you maximum stability. Two sizes of a table to pick, smaller 36 in. and bigger 42 in. You will need to get drawers for your art supplies because this drafting table doesn’t come with them. 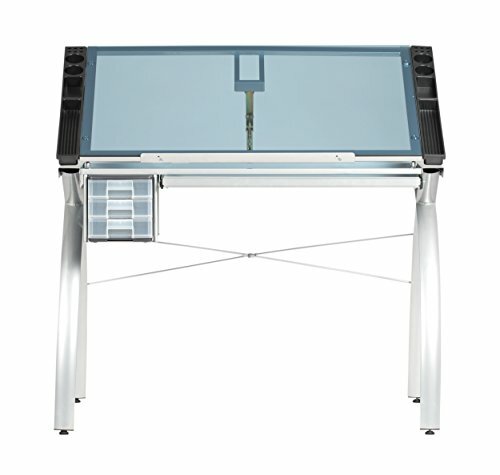 HIGHT IS ADJUSTED- The hight can be djustable from 31.5" to 49.5" ;the angle of the glass desktop can be adjusted from 0 to 60 ° to meet your different needs, it can be used as a drawing table, computer table or writing table for drawing or working. FLEXIBLE MOBILITY - Crafted with 4 smooth-rolling casters (2 that locked)，360°swivel casters for flexible mobility, 2 with brakes for easy locking the table in position, you can move it anywhere easily. SPACE SAVING - Contains ample storage space with a single shelf underneath the desktop and 2 slide-out drawers off to the side, contains 4 removable single-slot supply trays both sides to hold pens. OVERALL DIMENSIONS: 41.25"(L) x 24"(W) x 31.5"(H); Weight Capacity: 99 lbs.